Use in patients ≥18 years old, presenting within 8 hours of symptom onset, with anterior circulation (i.e., internal carotid, M1, or M2) LVO stroke. Measure ASPECTS using most recent CT imaging data. Apply with caution to patients with baseline morbidities. Patients ≥18 years old, presenting within 8 hours of symptom onset, with anterior circulation (i.e., internal carotid, M1, or M2) LVO stroke. The Pittsburgh Response to Endovascular therapy (PRE) Score was developed to identify stroke patients most likely to derive benefit from endovascular reperfusion therapy. Uses continuous (as opposed to categorical) variables, improving granularity of the score. Incorporates both age in years as well as a measure of mismatch between infarct core and ischemic penumbra (2 × NIHSS – 10 × ASPECTS) in the equation. Relies on ASPECTS, which has moderate inter-rater reliability. Does not consider pre-stroke physical status. Validated in a trial comparing third generation stent-retrievers with second generation endovascular therapy devices; has yet to be validated in more recent endovascular stroke clinical trials. Does not consider perfusion imaging data that may be used in patient selection. Predicts likelihood of good outcome (mRS 0-2) to better stratify patients for endovascular reperfusion therapy to derive maximum benefit. Simpler than other similar scores, without sacrificing discriminatory power for good outcomes. Patients with PRE Score -24 to +49 are likely to derive the maximum benefit from endovascular reperfusion therapy if successful revascularization, i.e. TICI (Thrombolysis In Cerebral Infarction) grade 2b/3, is achieved. Patients with PRE Score ≥50 are least likely to benefit from endovascular therapy. Rate of good outcome (mRS 0-2) or final infarct size was not affected by TICI grade 2b/3 reperfusion in the PRE Score ≥50 group. Use the PRE Score as an adjunct to clinical judgment, not a replacement. 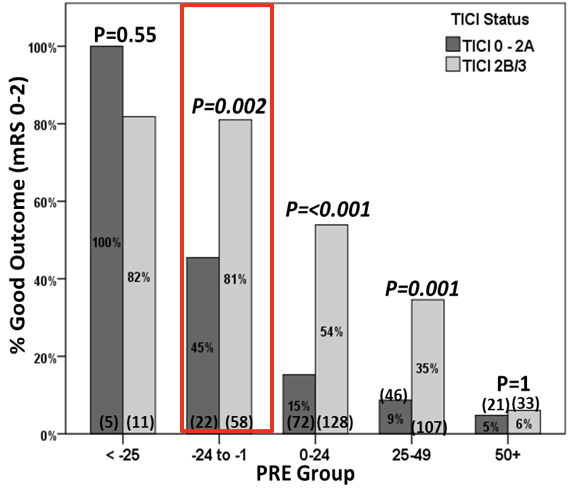 PRE −24 to +49: Likely to benefit from endovascular therapy if successful revascularization (TICI 2b/3) is achieved. PRE ≥50: Not likely to benefit from endovascular therapy. Figure: Magnitude of benefit for endovascular therapy based on PRE Score. TICI, Thrombolysis In Cerebral Infarction. mRS, Modified Rankin Scale. PRE, Pittsburgh Response to Endovascular therapy. Based on data from Rangaraju 2015, used with permission from the author. The PRE Score was developed by Rangaraju and colleagues in a derivation cohort of 257 consecutively treated patients at Grady Memorial Hospital in Atlanta with external validation in two institutional cohorts (University of Pittsburgh Medical Center, n = 393; Unitat d’Ictus Vall d’Hebron [UIVH], n = 204). The original study was a retrospective analysis, with significant differences in baseline demographics between the derivation and validation cohorts. Logistic regression was employed to predict for good functional outcomes, defined as mRS 0-2, at 3 months. Despite differences in baseline demographics, the PRE Score predicted clinical outcomes comparably across cohorts, thereby attesting to its wide applicability in patients with anterior LVO stroke regardless of epidemiologic disparities. The AUC for good outcome in the derivation cohort was found to be 0.79, and 0.79 and 0.72 in the UPMC and UIVH cohorts, respectively. External validation was subsequently performed in the Trevo2 trial (comparing MERCI and Trevo devices) and the IMS-3 randomized clinical trial, with comparable results. Rangaraju S, Aghaebrahim A, Streib C, et al. Pittsburgh Response to Endovascular therapy (PRE) score: optimizing patient selection for endovascular therapy for large vessel occlusion strokes. J Neurointerv Surg. 2015;7(11):783-8. Why did you develop the PRE Score? Was there a particular clinical experience or patient encounter that inspired you to create this tool for clinicians? Many prognostic scores for ischemic stroke in general have been developed, but very few were specifically developed for use in patients with large vessel occlusion (LVO). Since the LVO population represents about 20-30% of ischemic stroke and the group with the highest morbidity, we undertook a study to develop and validate a easy to use prognostic tool that uses the most commonly used clinically relevant variables to accurately prognosticate 3 month clinical outcomes, and also enable stroke doctors to identify the patients who are most likely to benefit from rapid endovascular reperfusion treatments. Furthermore, two other prognostic scales for LVO were available at the time of the PRE Score's development; however, these used prognostic variables as categorical bins rather than as continuous variables. In the era of individualizing therapies, we need to be able to maximize the prognostic utility of each patient's unique data points instead of collapsing them into categories or bins. The PRE Score allows us to do just that. When talking to family prior to endovascular stroke therapy, often the family wants to know what the chances of a good outcome are. To answer this question, we typically say that if we open the vessel, the odds are the highest. The PRE Score provides objective data to answer this exact question. If a patient has a PRE Score of 30, we can confidently provide objective and validated information to the family. This helps set the stage for realistic expectations early on. What pearls, pitfalls and/or tips do you have for users of the PRE Score? Are there cases when it has been applied, interpreted, or used inappropriately? While the PRE Score uses age, baseline NIHSS and ASPECTS as continuous variables, this comes with pitfalls too. ASPECTS has moderate inter-rater reliability, and therefore an ASPECTS read as 6 by one doctor may be read as 5 by another. This could easily exclude a patient from endovascular treatment if AHA guidelines are followed at face value. Therefore, one must be well-trained to read ASPECTS before using the PRE Score. Readers are referred to the University of Calgary ASPECTS page for formal training. Second, we have yet to validate the PRE Score in the most recent positive endovascular treatment trials. Once this is complete, we hopefully can predict "treatment effect" of endovascular therapy with more confidence. Even in patients with PRE Scores over 50, it is possible that a small benefit exists and that our sample sizes were too small to detect this difference. Therefore, we strongly recommend that patients should not simply be excluded from endovascular therapy if the PRE Score is >50. For these patients, we should use other radiographic information (perfusion imaging or MR imaging) and clear discussions with families should be had regarding the low magnitude of benefit and potential risks of endovascular procedures in the patients with PRE Scores over 50. The PRE Score is only suited for anterior circulation LVO. What recommendations do you have for doctors once they have applied the PRE Score result? Are there any adjustments or updates you would make to the score, given recent changes in medicine? If the PRE Score is less than 50, this provides a strong argument to treat the patient with endovascular therapy, especially if they present within 8 hours. Additional imaging such as perfusion imaging or MRI may not be necessary in such patients. If they present outside of the 8-hour window, the data is currently emerging. Hopefully, the results of the upcoming DAWN trial (Diffusion Weighted Imaging (DWI) or Computerized Tomography Perfusion (CTP) Assessment With Clinical Mismatch in the Triage of Wake Up and Late Presenting Strokes Undergoing Neurointervention) will help answer this question. For patients with PRE Scores over 50, the much lower magnitude of benefit must be discussed. While there still may be a small benefit in this group, our results showed no significant effect of reperfusion on clinical outcomes or infarct volume in this group. Incorporating CT perfusion data instead of ASPECTS in the PRE Score model. Our preliminary results suggest that this change does not significantly improve the model. We are now validating the PRE Score in more recent endovascular stroke trials, such as REVASCAT (Randomized Trial of Revascularization with Solitaire FR Device versus Best Medical Therapy in the Treatment of Acute Stroke Due to Anterior Circulation Large Vessel Occlusion Presenting within Eight Hours of Symptom Onset). A poster was presented at the International Stroke Conference in 2016. In your practice, how do you counsel patients using the PRE Score? When I am on the phone hearing about a patient at a referring hospital or in our ED, I quickly do the mental math to determine the PRE Score based on the patient's age, NIHSS and my assessment of the CT ASPECTS. This gives me a quick idea of the risk category the patient belongs to. If the patient has high risk features such as a malignant collateral profile or ASPECTS under 6 or poor baseline functional status, a PRE Score >50 helps me further build confidence in excluding such a patient from endovascular treatment. However, if there is a disagreement between clinical decision making and the PRE Score, I use additional data to help clarify the issue: CT perfusion imaging data and a more detailed discussion with the interventionalist as well as the family, and acknowledging that the odds of a good outcome are not likely to be high. Any other research you're currently working on that you're particularly excited about? As described above, the improvements of the PRE Score and further validation may help in making this tool more applicable to clinical use. The POST (Pittsburgh Outcomes after Stroke Thrombectomy) Score is a post-treatment prognostic score that uses age, final infarct volume and presence or absence of parenchymal hemorrhage as three strong predictors of long-term outcome in patients with anterior circulation LVO. Also, we recently found that the 24-hour NIHSS may be even better in predicting long-term outcome than the POST Score. We are now determining whether the 24-hour NIHSS can be incorporated into the POST Score model to further improve prognostic accuracy. Once complete, we hope to make an online calculator for the POST Score available for clinical use. 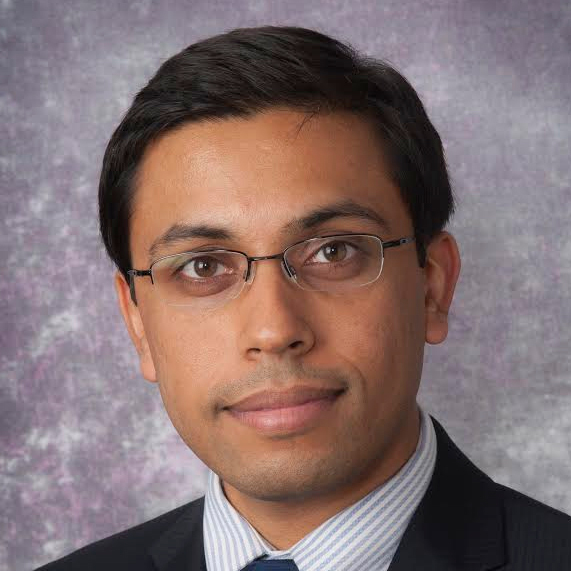 Srikant Rangaraju, MBBS, MSc is a board certified neurologist with specialty training in vascular neurology. His clinical research focuses on accurate prognostication of patient outcomes after ischemic stroke especially in those with large vessel occlusion. Dr. Rangaraju also runs a basic science lab that studies microglia mediated neuroinflammation within the brain after stroke and in neurodegenerative diseases. He works clinically at Emory University Hospital and Grady Memorial Hospital in Atlanta, Georgia.